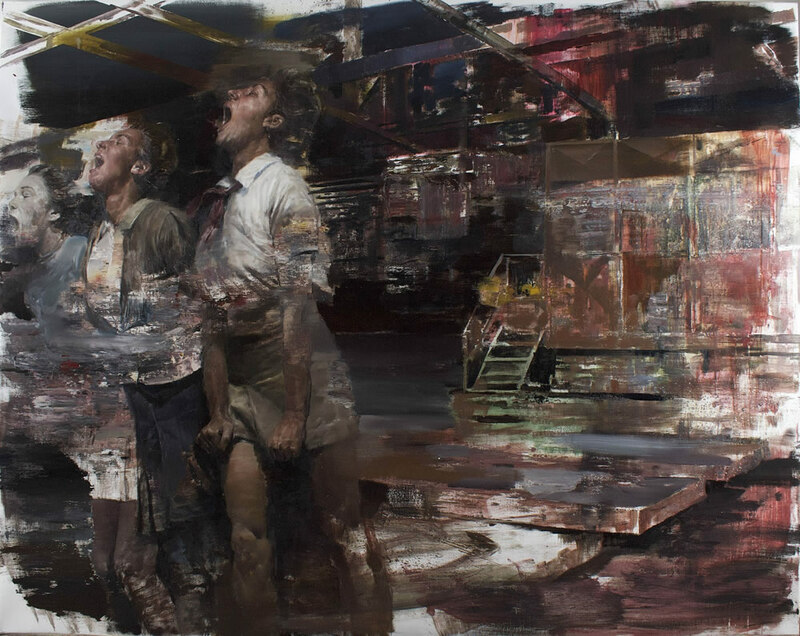 Romanian artist Dan Voinea creates hallucinatory paintings of characters descending into madness and fantasy. Roughly painted figures appear doubled or translucent; sometimes different bodies melt into one another, blurring the lines of identity. Featuring wardrobes reminiscent of the 20th century and a color palette derived from early color photos, Voinea’s work is imbued with a twinge of nostalgia for a time that perhaps never existed in the first place. We find characters floating or lying supine – an illusion to an alternate dream world we watch them experience with their eyes closed. 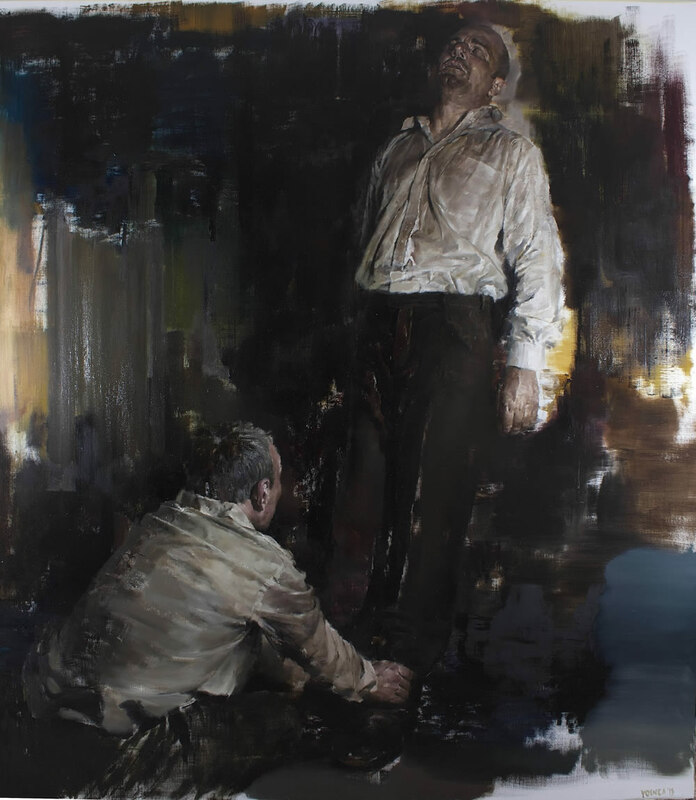 Voinea’s current body of work titled Street Performances removes from context the compact masses of performers and spectators in order to devoid them of any meaning and present them as a new reality. 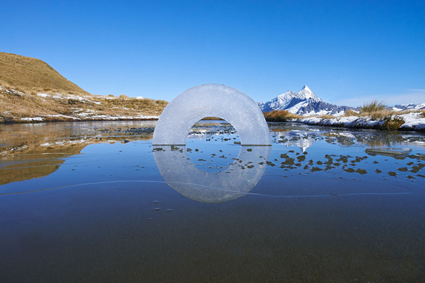 Semantics interfere, performance changes into an item of news, and ordinary things become performance. Streets are replaced by vaguely described sets. Characters coexist in a sort of non-communication devoid of entertainment. Solemn tones are gradually contaminated by serious overtones. This jigsaw, without emphasizing on the differences from the before and after periods, aims at the same thing: creating a present day reality out of the remains of a world set apart by standardization and autism. it looks like some one is trapped and wants to get out. I would like to discuss your art with you and explore possibilities for your work. I have tried to contact a few other times, please tell me how I can reach you or try me at RJD Gallery on Facebook. Superbe mais angoissant parfois !